On the 15th anniversary of the worst domestic terrorist attack in history—September 11—a college student’s memorial flag display was destroyed three times. The attack at Occidental College, widely reported by CNN, Fox News and the Washington Post, has reportedly been under investigation by the private Los Angeles college, known for humanities and past students such as Ben Affleck, Jack Kemp and Barack Obama. According to a recent statement, Occidental College knows who attacked the exercise of free speech. Citing privacy law, however, the school refuses to disclose details. The student who organized the 9/11 memorial said he has mixed thoughts about Occidental’s statement. The college pledged to have what it calls a “teachable moment” this spring, using a phrase made famous by former Occidental student Barack Obama early in his presidency. Occidental’s plans include an address by a scholar who regards free speech as limited, not absolute, and a discussion of free speech on college campuses. Additionally, Occidental College says it will stage a play which officials describe as challenging “preconceived notions about issues such as race, class and the law” and host a film series to “expose students to a variety of perspectives on 9/11”. Occidental announced that it will also screen a documentary about choosing “reconciliation rather than vengeance” in the wake of the 9/11 Islamic terrorist attack on the United States. When asked about Occidental’s response, Bliss said he would continue to speak out with what he regards as support from the administration. “I’d like to be able to trust the college, so I want to see if Oxy follows through on creating a discourse on free speech,” he said. Occidental officials had pre-approved his free speech exercise, Bliss said, which he displayed in the hours leading up to Sept. 11. 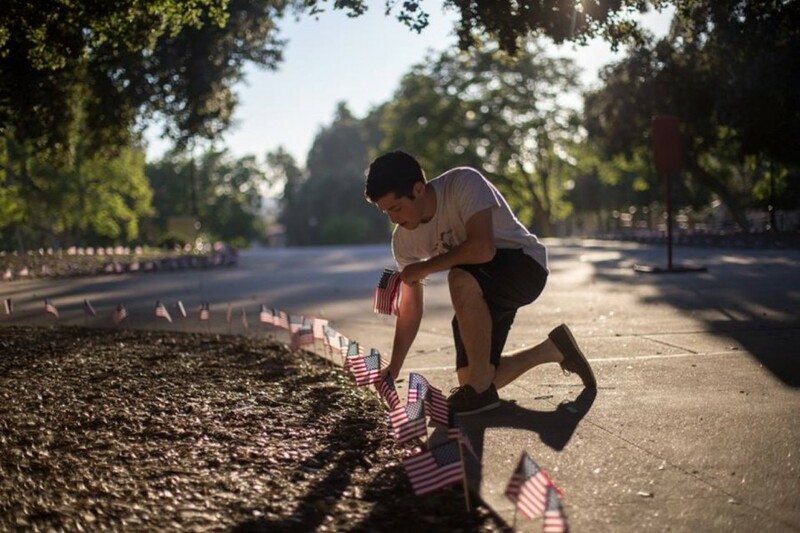 The conservatives’ club invited everyone at Occidental to take part in putting 2,997 small U.S. flags into the ground to commemorate the same number of mass murder victims on 9/11. Indeed, the student’s awareness of his divergent views caused him to soften the 9/11 display, which he stripped of political adornment, choosing not to include paraphernalia opposing radical Islam. At first, he said, the flags appeared to unite students. Bliss said the act of destruction—like the 9/11 attack—came in waves. The first use of force occurred around midnight on Sept. 11, he said. Bliss said he received a text message asking what had happened to the flags on display. He sprinted to the quad, where he saw that the display had been wrecked. Every flag had been stuffed into three garbage cans. Bliss and volunteers immediately notified campus security and began re-planting the flags. Some students confronted them, asking, “Do you know what it’s like for us to see American flags?” Bliss recalled. Bliss said he promptly informed Occidental officials about the incident and requested assistance. “We wanted to avoid a confrontation,” he said. He then returned to his dorm to get some sleep. Two students volunteered to guard the display overnight. A short time later, a volunteer reported hearing crunching sounds, which turned out to be the snapping of the wooden posts on the American flags. When volunteers called on the vandals to stop, they ran. Later, in daylight on Sept. 11, vandals charged at the display a third time, pulling flags out of the ground and riding bicycles over the flags while volunteers struggled to re-plant them. Bliss called and asked again for Occidental campus safety to protect the display. Again, Bliss said, no one was dispatched and no one was posted. A call to the college’s campus safety office was referred to a spokesman for Occidental College, who said that records show that campus safety received only one call after midnight “to file a complaint”. When asked why safety officials were not posted to guard the display from further damage and destruction, he said that Occidental “does not have the resources” to both protect a display in the quad and the entire campus. Bliss said that Occidental officials told him to not call Los Angeles Police. In the weeks following the incident, he said that his studies and life on campus have been distracted. The Dallas, Texas, native said he chose to attend the Eagle Rock college, where conservative 1996 GOP vice-presidential nominee and NFL quarterback Jack Kemp graduated and leftist Democrat President Obama studied for two years. However, the lack of defense adds to the cumulative effect, Bliss said, indicating that free speech at Occidental is under siege. Reflecting on the past several weeks, Bliss said that he “absolutely” would do the display again and that the 9/11 memorial matters. For now, Bliss said, he’s giving Occidental College the benefit of the doubt that the school will honor its claim to defend free speech. Meanwhile, Bliss said he now knows first-hand that, on today’s college campus, exercising free speech can trigger an attack. “My fear — because this was an equitable display — is that if we ever do anything [explicitly] political, [those responsible] might attack in an even grander way,” Bliss said.